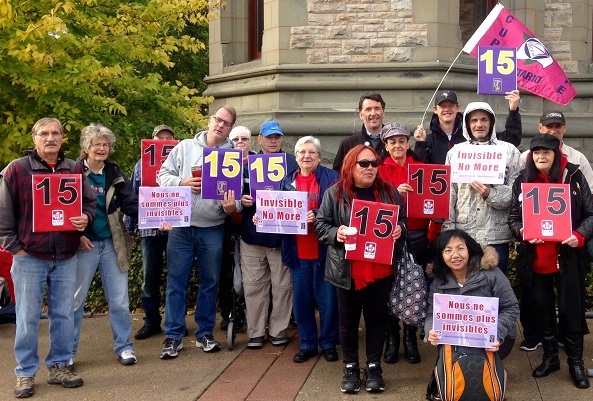 Today, Oct 15, 22 ACORN members in Ottawa rallied for the $15 federal living wage with benefits, as part of the Invisible No More campaign and in support of Justice for Janitors with SEIU Local 2. Members were joined by supporter and local NDP Candidate Paul Dewar, as well as the Ottawa & District Labour Council and CUPE. Mike Stringer, member of SEIU Local 2 and cleaner, spoke about the need for a raise to $15 with benefits which should be a starting point for cleaners. Check out Mike and Paul talking about the campaign!